One of the ways pastors and other ministers share in the mission of our triune God, is by joining with Jesus Christ, the wonderful counselor, in his ministry of counseling, in the power of the Holy Spirit, through the church. That being so, we appropriately ask, How does Trinitarian, incarnational theology inform pastoral counseling? I've been thinking about this for some time, studying Holy Scripture and books like Theology & Pastoral Counseling (a new interdisciplinary approach) by Deborah van Deusen Hunsinger, who teaches pastoral counseling at Princeton Theological Seminary. 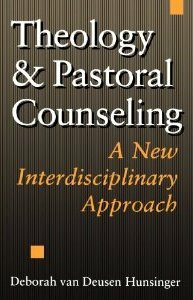 She helpfully describes an interdisciplinary approach to pastoral counseling, which draws upon the Trinitarian theology of Karl Barth and psychodynamic theories of psychology. I find her approach both sound and useful. According to Hunsinger, "Pastoral counseling, as a ministry of the church, is essentially interdisciplinary. Becoming equipped for this ministry requires both psychological and theological training" (p1). Rather than trying to integrate theology and psychology, she advocates that Christian counselors become bilingual--able to speak both "languages" with some degree of fluency. Though these two languages are not the same, looking as they do at different issues from different perspectives, they both helpfully inform a balanced, interdisciplinary approach to pastoral counseling. Hunsinger provides a helpful model for this approach, which she refers to as the "Chalcedonian pattern." Like the ancient Chalcedonian formula concerning the dual nature of Jesus Christ, this pattern applies the insights of Barthian theology and psycho-dynamic psychology, "without separation or division, without confusion or change, and with the conceptual priority of theology over psychology" (p10). This interdisciplinary counseling model does justice to both fields of study without compromising either one. This is an important, for some approaches to integrating theology with other fields of study (such as psychology) do violence to one or the other or both. One need only think of how certain young-earth creationists go about trying to integrate the theology and cosmology of Genesis chapters 1-6 with the earth sciences. Such attempts at integration often "cherry pick" from both fields of study, creating a mishmash that does justice to neither. To work in an interdisciplinary fashion in counseling is to place psychological insights concerning the human person (human nature, dysfunction, growth and healing) in the larger, foundational context of theological interpretation and meaning (p14). In this way, a Christian counselor brings a theological perspective to the therapeutic task. Fundamental to this theological perspective, is holding a theologically sound view of the human person. As often discussed here in The Surprising God, through the Son of God's incarnation, life, death, resurrection and ascension, all humans are redeemed and recreated. Thus their true humanity is "hidden in Christ," who in his own humanity with us and for us, is fully and perfectly human. This trinitarian anthropology has significant and transforming implications for how we counsel individual people and groups of people (as in family counseling), who struggle to "live into" their true identity in Christ by which they come to experience more fully the salvation which is theirs in Christ. From this vantage point, the theologically informed counselor is able to observe the psychodynamics of the counselee's struggles in becoming who they truly are in Christ, struggles that from a psychological perspective, occur at multiple levels. Note, however, that the place of starting, using this counseling approach, is not with the human person. Indeed, as Barth taught, "no anthropological perspective is useful as a starting point for understanding who we are. The human subject...can be understood only by the light of God's own revealing of Himself" (p27). With this theological perspective shaping all they do, including the application of psychological insights, the counselor becomes truly an agent of God's grace--a participant with Jesus, the "wonderful counselor," who works through the Holy Spirit, the "paraclete" (the other comforter or counselor), who then forms and sends the church in Christ's service. I teach a course in Christian Counseling a Grace Communion Seminary. This online, masters-level course explores the application of a multi-disciplinary approach to the task of short-term counseling that pastors and other church-based ministers are called upon to provide. Very needful topic and prayers will be said for the class.